Savoy – a French wine region popularly called as “Savoie”. Try these Unusual Wines from Savoy? Savoy, which is otherwise called as Savoie, is a French wine region. This is located in the far eastern parts of France with Swiss as its border. Savoy, which is a mountainous wine region, is located just south of the Lake Geneva. Yes, now you can understand why I gave the title as unusual wines. The location, as well as the geography of this French wine region, is very much defining the characteristics of wines produced here. These French wines are found to have a mild touch of Swiss as a result of which we can see several Savoy wines with labels bearing a white cross on a red-colored background. This represents the flags of both the Savoy and the Switzerland. Administratively, Savoy is one of the French departments in the Auvergne-Rhône-Alpes region. When it comes to viticulture, this region is found to have several separate sub-regions. We can see the vineyards scattered among four departments. As mentioned above, the region has Switzerland has its border on its eastern side. On the northern side, the Jura region is found to be its border. 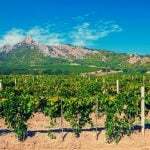 In total, the Savoy wine region is having almost 2,000 hectares under vine cultivation and is accounting for nearly 0.5% of the total wine production in France. When we look at the terroir of Savoy, we can find a great diversity in soil types, although most of the regions have lime-rich glacial substance in their soils along with scree. Although the region is located in the Mount Alps, it is found to have a distinctive microclimate. The region is experiencing a continental type of climate with some alpine and Mediterranean impacts. In this region, we can see vines being planted on the mountain slopes at about 820 to 1804 feet above the sea level. In spite of the higher altitudes, the vineyards of Savoy are experiencing a warmer climate which can be attributed to the southern or southeastern sunlight exposure coupled with the moderating effects of rivers/lakes of this region. If you are a white wine lover, then this is the perfect place for you as 70% of the wine produced here is white! The primary reason why white wines are dominating this region is because the reds would find it difficult to ripen in Savoy. In total, 23 grape varieties are planted in this region. Of these, five white varieties and two red varieties are shining well for their outstanding quality. Jacquère: This is the most planted variety and is accounting for almost half of all the plantings in Savoy. The wines are dry and early-drinking types with lower alcohol levels. Altesse: The wines are age-worthy and full of character. Roussanne: The wines will be aromatic with firm acidic levels. Chasselas: The wines from this grape will be light-bodied, dry, and easy-drinking types. Gringet: This produces quaffable wines with lower alcohol levels. Mondeuse: These produce well-structured wines with good tannin levels. Persan: This endemic grape variety produces wines with dense tannin and firm acidic levels.